Tuesday morning started out like any other summer day at Green-Wood. About 90 men and women who work on the cemetery grounds reported for work and headed out to mow the lawns, trim the grass, and weed the gardens. But, something was not right, as Ken Nielsen, acting foreman of the south zone, discovered. And worker after worker soon learned the sad truth: a very sick individual, or individuals, had vandalized 43 memorials and monuments of the dead. Green-Wood is in a rather unique position. 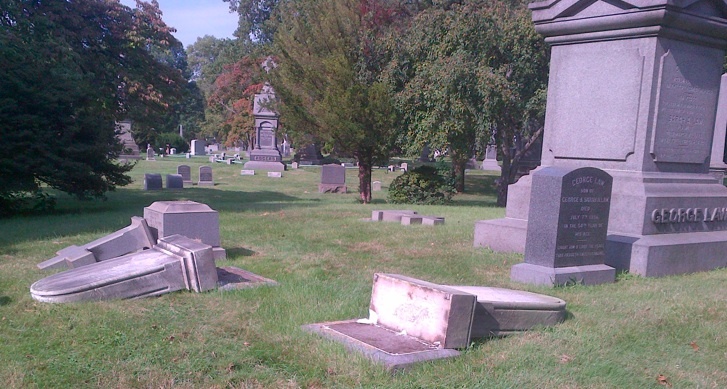 Cemetery vandalism is a fact of life–it happens across America every day of the year. But, at Green-Wood, we have a high cast iron fence that surrounds our 478 acres and limits access by those up to no good. We have an around-the-clock, 24-hour car patrol of the grounds. We have video cameras mounted throughout to discourage vandals. But, sadly, no cemetery security system is a guarantee against vandalism. I have been visiting Green-Wood since 1986, and, while I recall some incidents of vandalism, I cannot remember anything on this scale or close to it. Gravestones were pushed over and shattered. This brownstone monument was severely damaged--pushed over and shattered into pieces. An entire arch was toppled. Many pieces shattered as they hit the ground. This diminutive marble angel had its head snapped off. Urns were cracked and pushed off their bases. 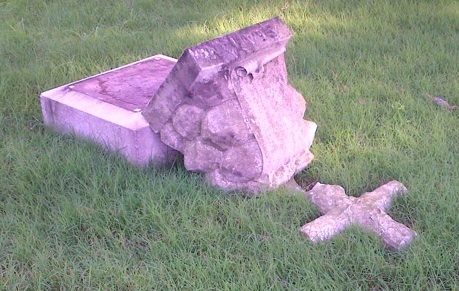 Four marble crosses were toppled; three of them broke into pieces. This little marble cross snapped off on impact with the ground. Three gravestones in the Law Family Lot were pushed over. This marble gravestone shattered into four pieces when it hit the ground. Two memorial porcelain photographs of the deceased were scratched repeatedly; another was smashed with a rock. Three gravestones were smeared with mud. And, this: a trash receptacle rolled down a hill, two stop signs were folded in half, and a Toro Workman cart was pushed up an embankment in an apparent effort to turn it over. It makes you sick to your stomach. The Bourne Family Tomb is an elegant design by leading architect Ernest Flagg. Flagg was Frederick Bourne's architect of choice. Bourne made his fortune as head of the Singer Sewing Machine Company. He commissioned Flagg to design the Singer Building, one of the most elegant skyscrapers ever built, Bourne's estate in Suffolk County, and his mansion on an island in Lake Ontario. 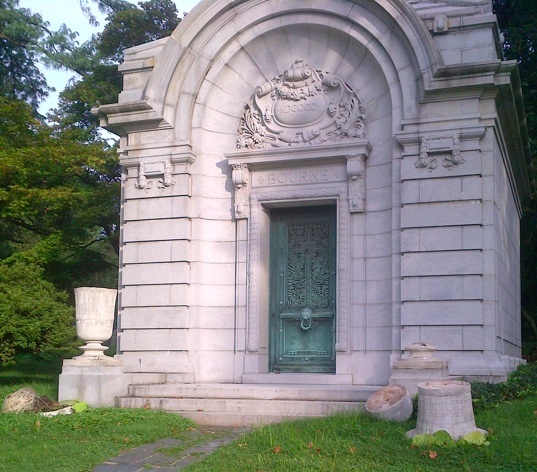 The urns in front of this Beaux Arts tomb were damaged. One of our security cameras did capture an individual who likely was involved in these outrageous acts. That videotape has been turned over to detectives from the Hate Crimes Squad, which is investigating. Hopefully, an arrest or arrests will follow very soon. Society has many duties. Certainly one of those is to protect those who cannot protect themselves. And, who is less able to protect themselves than those who have passed away? 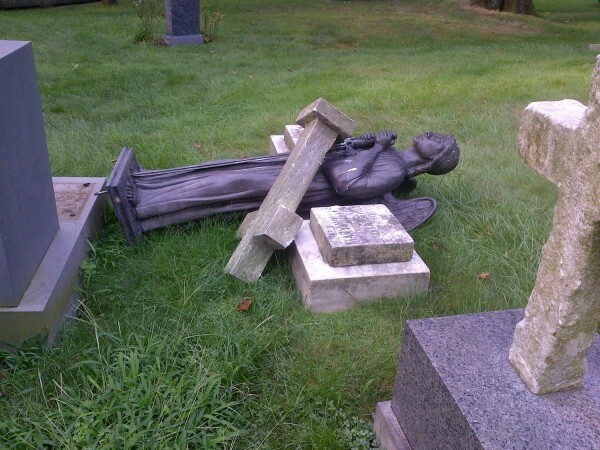 So, when mindless vandalism like this occurs, society, and all of us, have a duty to protect these memorials. Although neither Green-Wood Cemetery nor The Green-Wood Historic Fund have any legal obligation to repair vandalized monuments, we are stepping up here and will be repairing each and every one of them. We also have been contacting the families of those whose graves were desecrated. 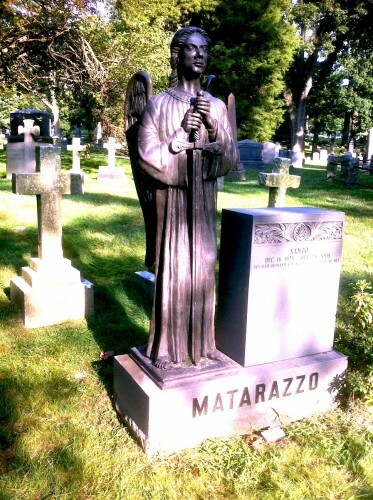 The bronze angel toppled and the cross pushed over onto it. And here is the same angel and cross, restored a day later. Ken Taylor, Green-Wood’s long-time vice president for operations, estimates that the damage is “well in excess of $100,000.” I already have made a contribution to help pay for these repairs and restorations. If you would like to do so, just click here. That there are those who are so disturbed and have so little in their lives that they are compelled to malicious acts of violence is truly sad and frightening. My wife and I have the pleasure of working with Green-Wood and supporting them in the community. We are at a loss for words. We walk in Green-Wood several times a week and have never seen anything like this, and that is after two tornadoes and a hurricane (which did some serious damage). Why would someone (or persons) do something like this? Biggles the mind and angers the soul. This is so disheartenng to see landmarks and beautiful pieces of artistry destroyed, distrubed and unappreciated. Sad that these vandals never learned to appreciate such heritage. My heart goes out to those families who have been desecrated by these thoughtless dark individuals. I’m disgusted to hear about this. I live 2 blocks from Greenwood and have shown it to my family, friends and anyone who is curious. It’s sad that there really are people in this world who have absolutely nothing better to do in their lives. No education, no interests, no ambitions, hate mongers. Human cyphers and wastes of life…they should be systematically plucked from society and thrown on some 3rd world island somewhere to battle wild boars. They do not belong in society. I hope they catch them and make them walk the plank. If they ever catch who did this they should make the person or people pay out of their own pockets for repairs. When they are made to take it out of their own pockets they will never do it again. SO SICK! I wonder how they would feel if it was a member of their family whose stone was distroyed. I feel sorry for them on Jugement Day! Seeing this desecration is more painful than I can say. Green-Wood’s staff and volunteers go to great lengths to honor & preserve the memories of the thousands of people buried there. This is a real tragedy and I sincerely hope the culprits are apprehended and prosecuted to the fullest extent of the law. Many old graveyards are desecrated and vandalized in Europe every year, that’s why some of them built very tall stone walls instead fences to prevent cemetery vandalism. I know Green-Wood is pretty big but you might consider this option.Those stone walls add beauty to G-W landscape..
eless life forms…If they show no respect for the dead, those vandal individuals should be denied burial rites when they are dead and dump their bodies in the sewer where they belong to!! I am both sick and heartbroken. There is a special place in hell for these savages! Those who disrespect the dead are tempting fate. Green-wood’s dedicated staff and volunteers work tirelessly to share this extraordinary Landmark with the public. 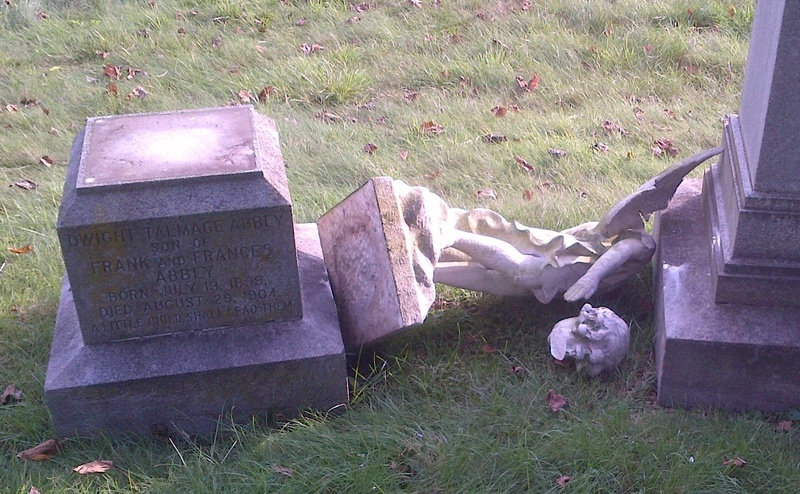 Whoever damaged these memorials is defacing art that is accessible to all…they should be prosecuted! 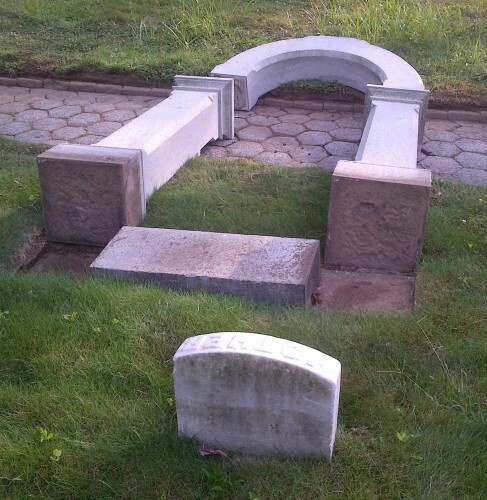 We need to do our best to protect historic cemeteries as they are significant cultural resources. Heard the news this morning, and Jeff, as always, your words are eloquent. Heartsick about the damage in one of my favorite places in New York. Can’t believe the depravity behind these acts of vandalism. 1/2 of my beloved family lies at Greenwood. How would these savages like their family members be disrespected? These animals have no respect, no morals, nor do they have mothers, fathers or families to be proud of – that is a fact! This is so sad and disgusting. How empty the lives of these people must be. My grandchild is buried there and I sobbed when I saw the damage. Why would anyone do something like this? You would have to be so angry with the world. How very very sad, not only for the families of Greenwood, but for the lives of the individual’s who are responsible for this desecration. You will have to live with this for the rest of your life. Is there a listing of the names of the descreated plots? I can’t believe how sick people can be. Let the dead rest in peace. We do have a listing of all of the damaged monuments. However, we will not be publishing it. I’ve been a member of The Green-wood Historic Fund for years and been on many tours of the cemetery.In the early 1900’s Dreamland in Coney Island was burned to the ground during the summer season but was turned to a money raising tour of the ruins.Why can’t this vandalism be utilized to help? Myron–Thank you very much for your membership in The Green-Wood Historic Fund. We appreciate your support for all we try to do at Green-Wood. We do have a cutting-edge restoration program at Green-Wood. 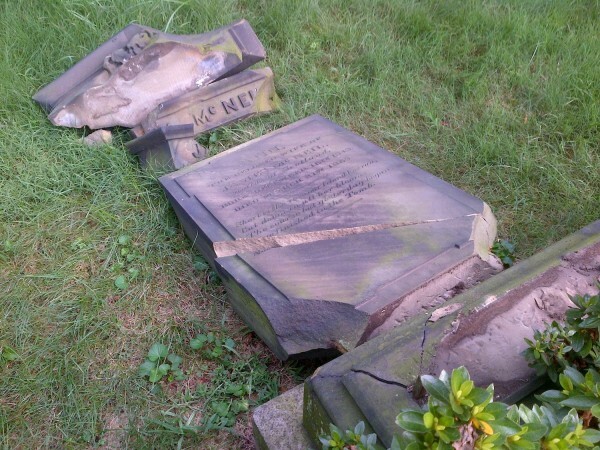 Already, just days after this vandalism, many of the gravestones have been lifted back up and placed back into position. I was out on the grounds on Friday and saw a two-man restoration team put a shrouded urn back on its pedestal. I saw them put a monument, pieces of which had been scattered on the grounds by the vandal or vandals, back together again. However, the memorials that were severely damaged–an angel with its head and wings snapped off, a marble gravestone shattered into pieces, and others–will take hours of work, and money, to restore. We will do that job–but, any donation to support this, would be greatly appreciated. Donations may be made on our website, http://www.green-wood.com Just look for the donation banner towards the top of the home page. Thanks for your support! I posted a caption on Yahoo; however, viewing the photes of the damages on this website was somehow more graphic and disturbing than merely reading about it. I take a small measure of comfort that one of the security cameras captured an image of a possible suspect. You can repair but never restore what was damaged. I am so sorry. What a sad statement of today’s society. I have ancestors buried there but even if I didn’t I would be greatly disturbed. Will make a donation and see if I can round up some others. terrible people out there, but as always, karma will find them.